Norfolk Island Agricultural Show is an annual event held in October. 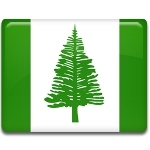 The culmination of the show falls in the second Monday in October, it is an official public holiday in the Territory of Norfolk Island. The full name of the event is the Royal Agricultural and Horticultural Show. It was first held in February 1860, four years after the first permanent settlement was founded by settlers from the Pitcairn Islands. Anglican missionaries actively participated in the organization of the show until they departed from the island in the early 1920s. Agriculture plays an important role in the economy of the Norfolk Island because the territory prohibits the importation of fresh vegetables and fruit. Most produce has to be grown locally, so many islanders are actively engaged in farming. For them, the show is an opportunity to showcase their achievements. The annual Agricultural and Horticultural Show is one of the most important events for the Norfolk Island community. The show itself is held at Rawson Hall in the town of Burnt Pine. Farmers proudly display fresh vegetables and fruit. The show also involves food and drink stalls, art displays, pet shows, amusement rides, performances etc.